Yes I agree. Beautiful moment. Absolutely gorgeous capture! My stay there a few years back was quite rainy, but still beautiful. One of the most beautiful and romantic places I have been! Thanks tiny lessons blog! Wow. That’s really quite magical. Magical and romantic! Thank you The Bumble Flies! what a really romantic moment to spend with your loved ones! Yes, you will be charmed by love and the scenery! Yes, there are places where you want the world to stand still for just a moment! Beautiful one Michael! I have often wondered why a sunset looks more beautiful than a sunrise…any idea? Lovely image Michael. This is another of my favorite cities. This is also one of my favourite cities. Thank you alphathread! BEAUTIFUL lighting and subject matter! Thank you for the kind comment Mary! Beautiful Venice. We took a Gondola ride just before dark and were able to enjoy the night lights of Venice as we floated down the Grande Canal. It’s one of the most beautiful nights of my life. The music from restaurants filled the night sky and everything takes on a golden glow. I love how your photo just hints of the promise of that evening. Thanks Stephanie for reblogging this on! Another gorgeous photo, Michael! 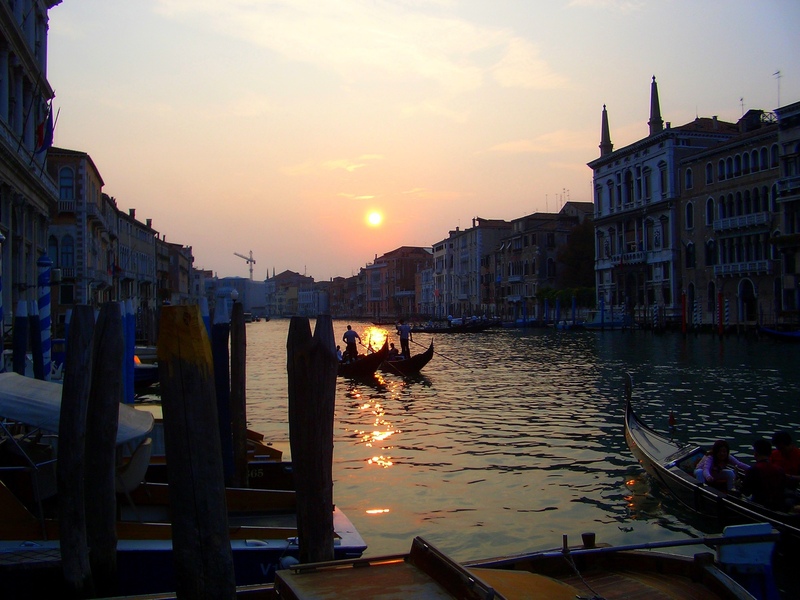 It perfectly captures the feel of the ideal Venezia and the part I love most about that city. Have you watched the old classic movie “Summertime” with Katherine Hepburn and Rossano Brazzi? I highly recommend it and I think you might like it! I took a look at how Wiki describes the movie, looks very interesting. I like Hepburn anyway, will find chance to see the movie! I suppose you know that I am crazy about Italy. I like Spain too, Hawaii, and lots of places. need to write a travelogue about my Venice trip. It was in 2004 , Old photos on film….but it was a fantastic trip . We were there for the carnival . Will wait for your post then!